In the past few years, automation and the effect that it’s having on the workforce has become a hot topic of conversation. Almost daily, in the WSJ or on Bloomberg, you’ll see an article about automation and how it’s negatively impacting employment. At the same time, major research institutions like McKinsey, Brookings, and Pew are releasing studies on the topic. Findings from these studies all draw the same conclusion: 30–40% of US jobs will be lost to automation over the next 20 years. When I see multiple forecasts, which arrive at the same conclusion, I get a little nervous. When the consensus expects one thing to happen, quite often the exact opposite ends up occurring. Here are two reminders of just how wrong the consensus can be. 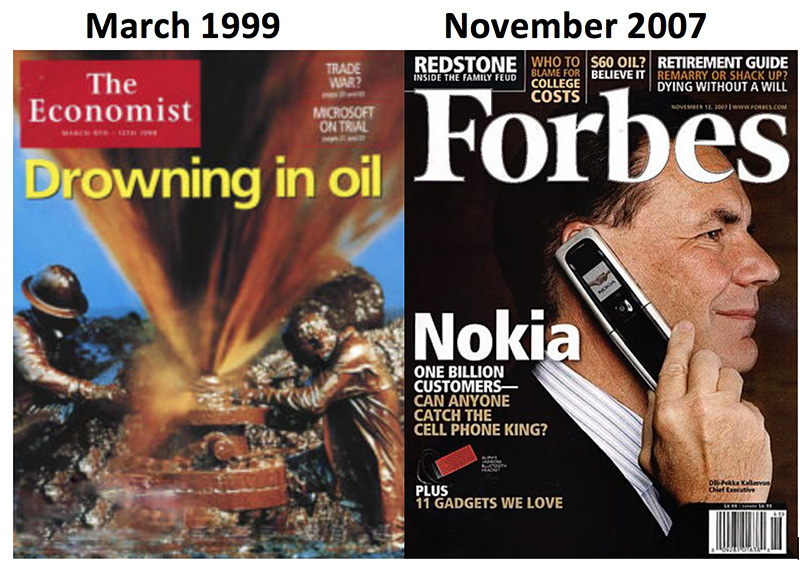 March 1999: Oil was at $12, and the consensus said it was headed lower. As we know now, that was pretty much the bottom for oil prices. November 2007: Nokia had a 37% market share, and its stock price was $39. Today, it has less than 2% of the market, and its stock price is below $5. Needless to say, investors who allocated capital according to these prevailing thoughts would have been on the wrong side of two seismic shifts. While automation and technology are having a massive effect on employment, when I see everyone falling into line with the consensus, my “inner-contrarian” alarm bells go off. When this happens, it tells me that I should seek out independent and unique perspectives. Someone who offers exactly that is Karen Harris. I would wager you have never heard of Karen. If not, it’s my delight to introduce you to her and her ideas. Karen Harris is the Managing Director of Bain & Company's Macro Trends Group. Karen and her team at Macro Trends focus on developing insights about global macroeconomic and social trends. They also work with institutional clients to embed macro strategy into their investment and business decisions. I am featuring Karen in this five-part series because of her pioneering work on the declining cost of distance–a topic which fits hand in glove with automation, and has profound implications for investors and entrepreneurs. Before we proceed, I want to let you in on a secret: Karen’s work on spatial economics and the declining cost of distance made me rethink my thoughts on the US economy, and how society will function in the future. The declining cost of distance may be the one of the overarching trends that shapes the economy and financial markets in the coming decades. When I say this is one of the most critical concepts to grasp going forward, I mean it. Today, I’m going to take you through this concept, and show you what it means for us. Let’s dive straight in. While not widely recognized, the cost of distance—that is, the cost of moving information, people, and goods—is a key driver of business and individual decision-making. For example, the cost of moving goods is the reason why companies like Amazon strategically place their warehouses near major transportation routes. On an individual level, the cost of moving oneself is the reason you would ideally live near your workplace. To date, the cost of distance has remained a critical calculation for businesses and individuals regarding where to operate and live. Which leads to the question: How would the world change if the cost of distance fell dramatically and greatly reduced the importance of location? Well, thanks to technology and automation, we’re starting to find out. Information: Compare the cost of sending information via an email to sending it by postal letter. Or the cost of making a long-distance phone call today versus two decades ago. Goods: Data from The World Bank show that the cost of transporting goods by air and ocean freight has dropped substantially over the past 40 years. Going forward, autonomous vehicles and delivery drones are expected to reduce the cost of transporting goods by a further 75%, according to Macro Trends. People: The rise of online communication channels and computer systems has enabled many individuals to work from remote areas, so they no longer have to travel to an office. Technology is creating a post-urban world in which physical location will not be the primary driver of where people live. This is the biggest shift in how economies function since the Industrial Revolution, when the population of London and other English cities doubled in just 50 years. The declining cost of distance will allow millions of individuals to reassess where they live. At the same time, constraints on businesses such as scale and density will be reduced, creating new opportunities for businesses, investors, and entrepreneurs. Think about where you would live if you could work from anywhere. Or, what would happen to urban economies and real estate prices if millions of people decided to leave? These are just two factors to consider on how the declining cost of distance is a complete game changer. Let’s run through some of the implications. The declining cost of distance will allow businesses to operate at a smaller scale, which will disrupt the tight constraints that most operate under, today. Let’s use the average Apple store as an example of how this is going to completely change the economic landscape. Today, a 6,000–8,000 square-foot Apple store requires a population of roughly two million people within its target radius to be profitable. This required population density is a huge barrier to entry, making small operations completely unviable. But I have good news, automation is changing that. Automation is also changing the business model of casual dining outlets like McDonalds and Burger King. As the following chart from Macro Trends shows, with the help of automation, these outlets will be able to reduce their break-even costs by 30%, annually. Now, here’s why the declining cost of distance fascinates me—and why it offers a unique perspective on the link between automation and employment. On the surface, automation is bad for jobs. 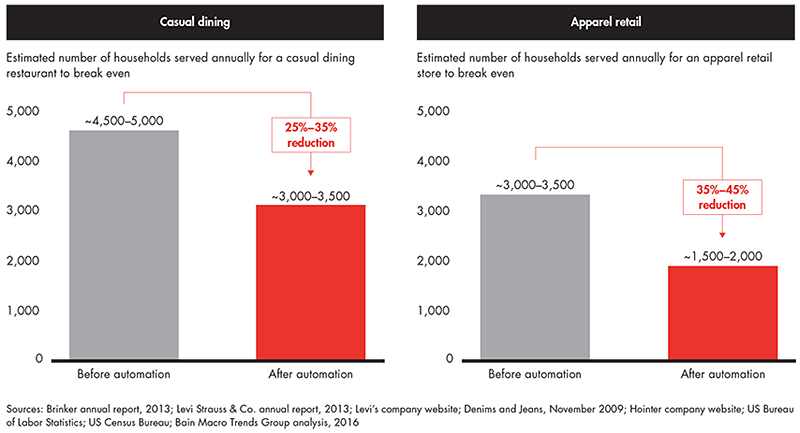 For example, Macro Trends estimate that by employing service robots, casual dining outlets could reduce staff from 25 to 8 people. However, as automation will enable businesses to operate at a smaller scale and scope, it may create jobs net-net. Hear me out. While automation will reduce the number of people working at each location, by lowering operating costs, automation will make smaller scale and scope locations economically viable. In effect, the volume of stores would increase, while the number of people working at each location would fall. For the first time ever, large retailers and dining chains will be able to operate in smaller, less dense markets. The large retail stores and restaurant chains that I have the pick of here in Dallas, may open locations in the much smaller neighboring cities of Allen and Katy. As I mentioned above, when there is a strong consensus on a topic, it almost always pays to seek out an independent view. While automation will render some jobs obsolete in the coming decades, I believe it will also create a lot of opportunities. Karen and Macro Trends’s groundbreaking research into the declining cost of distance has convinced me of that. Along with changing how businesses operate, the declining cost of distance will also alter where individuals choose to live and how they work. How does low-cost, rural living with a city wage sound? According to the US Census Bureau, the percentage of the US population that lived within 10 miles of a city center declined by 2.2% between 2000 and 2010. That might not seem much, but it represents almost 6 million people—more than double the population of Chicago. While the declining cost of distance is only beginning to gather pace, it is likely one of the reasons for this move away from cities. As more businesses open locations in less dense, rural areas, these areas will become more attractive places to live. 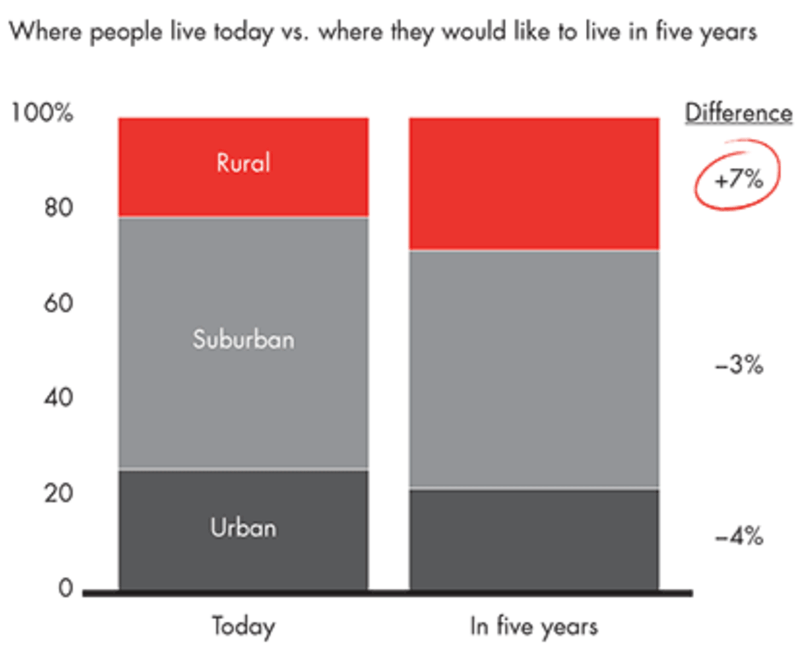 A 2016 Macro Trends poll shows that an increasing number of people want to live in rural areas. However, a greater variety of amenities is only the start of how the declining cost of distance is going to transform rural areas… and possibly cities, too. Virtual communication tools and computer systems are giving people who live in rural areas access to many of the same employment opportunities that city dwellers have. As opportunities to telecommute (work remotely) increase, fewer people will need to travel to work. Already, 37% of US workers say they work remotely or have done so in the past. That’s a four-fold increase since 1995. This trend toward working remotely is actually very close to my heart, it’s how Mauldin Economics operates. Since my partners and I founded the company back in 2012, we have been a “virtual business.” Although we have over 40 members of staff, no more than three of us are in the same location. Right now, my team lives in a wide range of locations: from Dallas to Dublin, Ireland, and Vermont to Vilnius, Lithuania. While we operate across several time zones and live in vastly different locations, thanks to online communications tools and shared computer networks, we operate as if we were all under the one roof. At the same time, the absence of an office greatly reduces overhead costs. Best of all, each one of us gets to work from wherever we please. Take my friend and colleague Jared Dillian, for example. When Jared was working at Lehman Brothers in New York, there was no escaping the ultra-high cost of living. Today, Jared is able to work from his beachfront home in South Carolina. Geographic arbitrage. 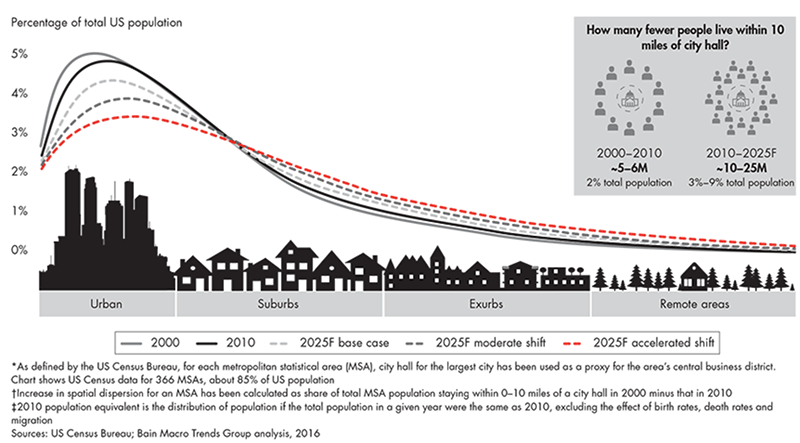 As the following chart from Macro Trends shows, its base case is that a further 10 million people will move out of urban areas by 2025. A move of this magnitude would have massive implications for the economy and the employment landscape. For example, a mass exodus to rural areas could create a boom in the construction industry, akin to what took place in the 1950s. Conversely, urban real-estate prices, which are notoriously high across the globe, could plummet as demand falls. Still, there are a lot of unknowns. 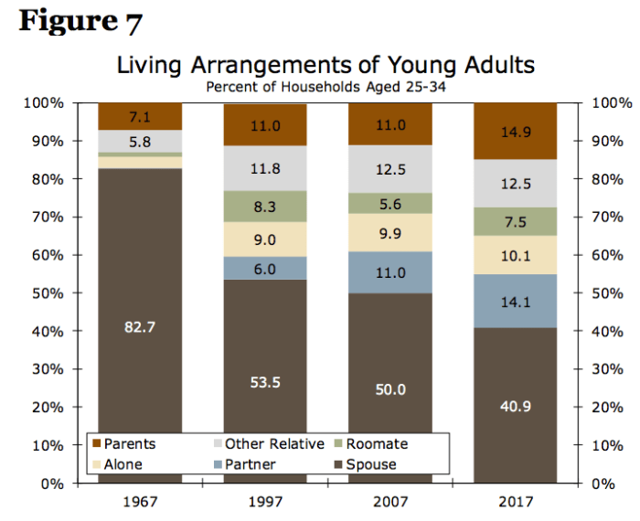 Would millions of Americans switching from urban to rural living ignite a baby boom and cure our demographic problems? It’s certainly not out of the question. After all, birthrates are substantially higher in rural areas. Plus, families could dramatically reduce their cost of living by moving out of cities, allowing them to feed more mouths. This is just the tip of the iceberg. I have many more questions I want answered about the declining cost of distance. For example, what are the opportunities and risks for investors, and how will the reduction in the scale and scope of businesses in advanced economies affect emerging markets? Karen will address these questions and provide other insights from her team’s work at Bain, when she delivers what promises to be an enthralling speech at my Strategic Investment Conference in San Diego, next March. Yet, Karen is only one of the brilliant minds that you’ll get exposed to and have the chance to meet at the SIC. It’s going to be an intellectually thrilling event, and I hope you can be there with me to experience it firsthand. To learn more about attending the SIC 2018, and about the other speakers who will be there, I encourage you to click here. I attended my first conference this year and loved it! I am a small investment manager just starting out, so I was looking to gain some perspective on how to protect my portfolio and profit from likely events that will be occurring in the future. That concludes the third part of this series. 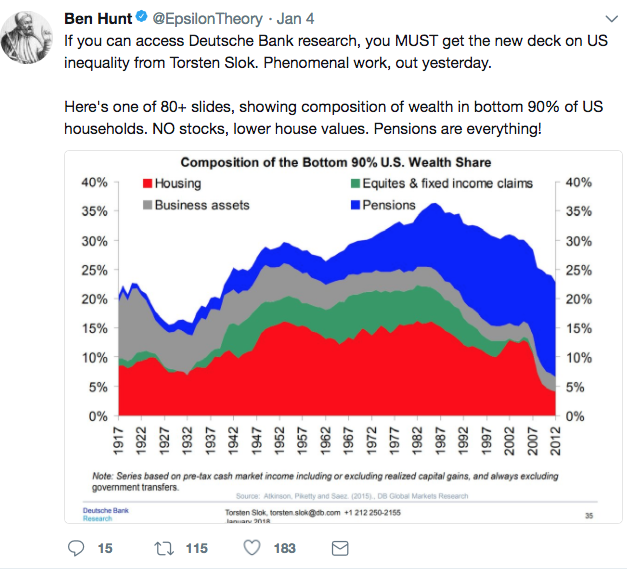 In the next installment, I share my thoughts on Lacy Hunt’s “big idea” that fiscal and monetary policy have become incapable of generating growth. The mutual fund industry has spent years trumpeting how costs have come down for investors. That’s true, but misleading. Asset managers haven’t exactly slashed their fees. 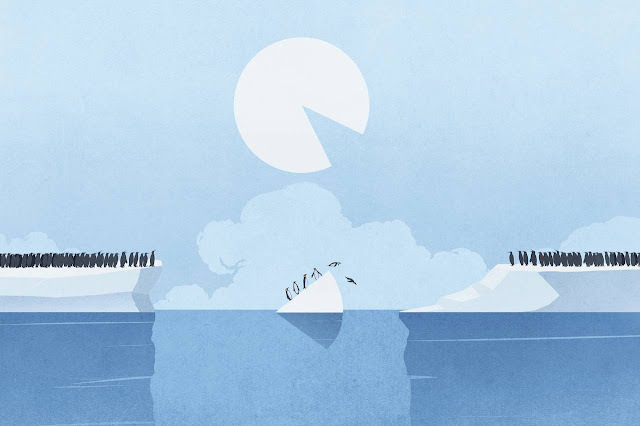 Instead, the credit goes largely to investors—but some of them are being left behind. 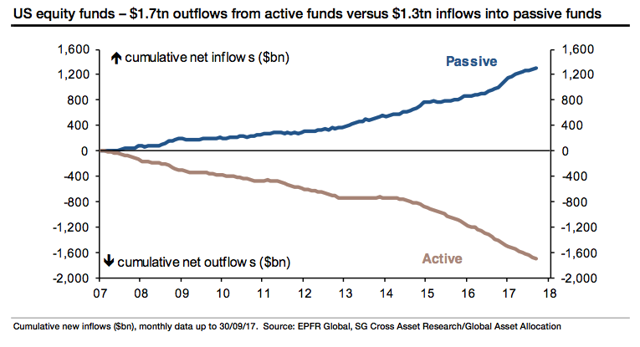 When given the option, investors have flocked to lower-cost funds: That’s actually the real trend behind the tired active/passive debate. Sure, actively managed funds on the whole saw $396 billion exit last year through November, while cheaper index and exchange-traded funds took in $694 billion. 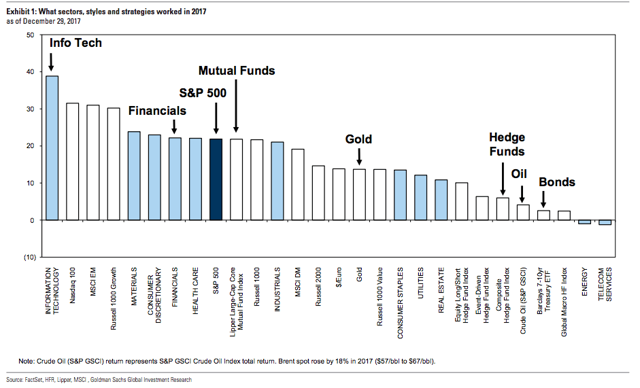 But low-cost actively managed funds actually did quite well, thank you very much, garnering almost $353 billion of new money in the same period. Some 78% of all mutual fund assets now sit in the cheapest two quintiles. Yet $1.3 trillion, more than 8% of the industry’s assets, remains in the two priciest quintiles of annual fees, according to Morningstar Direct. So who are the investors in these funds? Are they unaware of how much they’re paying for their funds, or do they have no other choice? Barron’s wanted to know which portfolios those funds may be in—and why they are still there. The answer is troubling, though perhaps not surprising: The little guy pays the most. But those little guys are bigger than you might think. Granted, some asset classes or investing styles require more expertise, so those funds can be more expensive—think frontier market or unconstrained bond funds. But that’s not what we’re talking about. Beyond the funds that charge more for understandable reasons, there are many more where the fees are much harder to justify. To find the most egregious examples, Barron’s culled data from Morningstar Direct; Broadridge Financial Solutions, a fintech and fund research firm; and BrightScope, a 401(k) data and analytics firm, and canvassed financial advisors, retirement consultants, and fund researchers. There are two main problems: Some funds simply charge too much, while others are pricey because of how they’re sold, via a dizzying array of share classes. There are 8,066 mutual funds with distinct portfolios. But when you tally up the various iterations of each fund, there are more than 25,000. Share classes are essentially financial agreements between the fund company and the distributor of the fund (a broker, advisor, or retirement plan). As a result, investors can pay very different prices for the same fund depending on which share class they’re in. Investors pay an annual fee called the expense ratio; it’s calculated as a percentage of their investment. The expense ratio includes a laundry list of shareholder fees that go to the administration and operation of the fund, including the fee charged for managing the portfolio, which must be the same across all share classes. But the expense ratio can also include another fee, known as the 12b-1 fee, which goes to costs related to distributing and marketing the fund. That means each share class can charge investors differently. This is where it gets tricky—and it’s worth noting that exchange-traded funds don’t have share classes and don’t charge a 12b-1 fee; their expense ratio is the same no matter how or where you buy them. Understanding share classes and the 12b-1 fee is key to determining if you are paying too much for your mutual fund investments. This obviously creates the potential for abuse, with advisors essentially incentivized to choose products that pay them the most, and even to churn portfolios too frequently to keep their pay coming. That’s why investors have increasingly flocked to independent financial advisors who charge an annual fee based on assets, rather than a commission. These fee-based advisors choose funds that don’t carry sales charges, and often use cheaper share classes. Half of the fund industry’s assets are now in cheaper institutional shares, which don’t usually charge 12b-1 fees, and another third of assets are in no-load shares, which are not allowed to charge more than 0.25% for a 12b-1 fee. That’s a maximum of $25 on a $10,000 investment, though no-load funds often don’t charge any 12b-1 fee. Granted, the expense ratio is just one part of the total cost of investing—investors working with advisors who can get them into cheap institutional share classes must still pay their advisor’s fee. But the expense ratio is the preferred proxy for mutual fund costs—and Morningstar’s research has found it to be one of the best predictors of a fund’s future performance. Now, here’s where the fund industry trumpets how cheap investing has become. As more money has moved into these cheaper share classes, the dollar-weighted average expense ratio has declined, falling to 0.63% for stock funds in 2016 from 0.88% a decade earlier, according to the Investment Company Institute, an industry trade group. But dollar-weighted averages just tell the story of where investors are putting their money—into the cheapest funds—and are not a reflection of the fund industry slashing prices. Just because more people are shopping at Marshalls doesn’t mean the price of designer clothing has fallen. A study by Morningstar found that a simple average of expense ratios for the largest 2,000 funds did not change from 2014 to 2016. What’s more, not everyone has access to the industry’s version of a bargain. And some funds are simply too expensive. Even after accounting for how their funds are sold, there is still $663 billion in assets in funds charging above-average or high expense ratios, according to Morningstar Direct. Many of these funds are small; more than 2,800 have less than $250 million in assets. Expense ratios are supposed to drop as assets rise, but investors may face an uphill battle since a shrinking asset base means fewer people to bear the costs of operating the fund, which could nudge the expense ratio in the wrong direction. SO WHERE ARE these pricey funds—and how do you ensure you’re not invested in them? Since the way you buy your mutual fund affects the expense ratio you pay, bigger is better. Working with a fee-only advisor generally gets you into cheaper share classes than on your own. Bigger employers are usually better able to negotiate for cheaper funds in their 401(k) plans than their small-business counterparts. To root out the worst offenders, Barron’s focused on three areas: Funds sold through commissions, funds in small 401(k) plans, and target-date funds. Load funds don’t have to carry higher annual expense ratios, but they often do. The asset-weighted average expense ratio for an institutional share class of a stock mutual fund is 0.52%. For investors in load funds, the average was double—1.02%—according to Broadridge. That’s in part because commission-paid advisors are far less likely to use index funds, since they’d typically get paid less. That’s a significant gap—a difference of half a percentage point, or 50 basis points, can leave investors with 13% less after 30 years. So paying 0.75% annually versus 1.25% annually means you’ll end up with $23,400 more on a $50,000 investment that earns an average 5% a year over three decades. “It is confusing. As an individual investor, you don’t necessarily know that there is a trade-off and an alternative share class. Investors need to ask what they own and why,” says Dawn Doebler, a Bethesda, Md.–based financial advisor for the Colony Group, which oversees $7.5 billion. What to watch out for: a portfolio filled with an alphabet soup of share classes, or a portfolio of $250,000 or more that is stuffed with C share classes. C shares, which are beginning to dwindle as some brokers convert them to A shares, still account for $719 billion in assets. C shares can charge the maximum 1% 12b-1 fee, making them one of the most expensive options. For accounts of $250,000 or more, cheaper options should be available. Pricey funds also crop up in advisory relationships. Another tip: Check for subadvised funds, which can be more expensive. For example, the $4.5 billion Hartford Equity Income fund (ticker: HQIIX), which is subadvised by Wellington Management’s veteran manager W. Michael Reckmeyer, charges 0.77%—an average expense ratio, according to Morningstar. But Ribe says investors can get a similar portfolio through the $31 billion Vanguard Equity Income fund (VEIPX), two-thirds of which is also run by Reckmeyer but costs just 0.26%. Switching to the Vanguard fund would have meant an additional 0.75% in annualized returns over the past five years, Ribe says. Similarly, John Hancock Equity Income (JHEIX) charges 1.14% and is subadvised by T. Rowe Price manager John Linehan. But the T. Rowe Price Equity Income fund (PRFDX), which Linehan manages, costs nearly half as much, at 0.66%. On average, 401(k) plan participants paid less for mutual funds than those investing outside of plans—an average expense ratio of 0.48% for a stock fund compared with the broader asset-weighted average of 0.63%, according to the latest joint analysis by 401(k) tracker BrightScope and ICI. Large 401(k) plan sponsors enjoy some of the cheapest expense ratios, sometimes paying as little as $3 per $10,000 invested. But smaller 401(k) plans aren’t as fortunate. While plans with more than $1 billion paid an average 0.39% for their stock fund, plans with less than $10 million paid more than double that, 0.82%. The data understate the problem, in part because small plans (defined as those with fewer than 100 participants) aren’t required to provide the same level of disclosures, Hauptman says. Though small, these plans are numerous, representing 90% of all 401(k) plans available and 8.6 million people—and holding about $680 billion, or 16% of 401(k) assets. A few reasons for the fee disparities stand out. One is the fund lineup. When the company providing the documentation and administrative tasks, or record-keeping, for a plan is also the source of the investments, proprietary funds tend to dominate the choices. Larger plans have separated the roles, requiring the administrator of the plan to offer funds from other companies. That has not happened as much in smaller plans. Perhaps even more notable is the presence of insurers, which tend to have higher-cost funds. Insurers are the record-keepers for just 14% of the largest plans but for more than half of small plans, according to BrightScope. What’s more, besides having less heft to negotiate for lower expense ratios and plan costs, smaller plans’ expense ratios often include the higher costs related to servicing smaller businesses’ retirement plans, which are then spread across fewer assets. “It’s a bit like no-fee checking at Chase. If you have $1 million in the account, you get it free. You have to pay if you have less,” says Brooks Herman, BrightScope’s head of data and research. Unfortunately, there’s not much that participants in a pricey 401(k) can do—and the long-term tax advantages of investing in a 401(k) versus a taxable account almost always outweigh even the priciest of funds. But Christopher Jones, chief investment officer at Financial Engines, which offers financial advice to retirement plans, says that investors in small 401(k) plans paying more than 1% in fund expenses should put pressure on their plan sponsors to ask why. Larger companies have been sued for not offering their participants lower-cost fund options, and consultants are turning their attention to this part of the market, which could turn up the pressure. When changing jobs or beginning retirement, investors should evaluate whether they can get the same funds for less (or better funds) by rolling their 401(k) into an individual retirement account. Some plans allow for “in-service withdrawals,” allowing investors to roll their 401(k) assets into an IRA while still working. Target-date funds, the default option in many 401(k) plans and a one-stop shop for investors looking for simple diversification, epitomize the “set and forget” type of investment. These funds of funds offer an asset allocation that changes over time. “We encourage people saving for retirement to set and forget it because we don’t want them to churn investments. But that may have diluted the incentive to take a more active role in monitoring the fees,” says Sheila Bair, the former chair of the Federal Deposit Insurance Corp. and now advisor to Blooom, a robo-advisor that oversees $1.8 billion, focusing on individuals’ retirement accounts. Like the precut vegetables at the store, these funds cost a bit more than if someone assembled the pieces themselves. That extra fee varies based on how an investor bought the fund, with those using A or C shares often paying more than going direct. While most of these funds live inside 401(k) plans, some are sold through commission-oriented brokers. “If a small investor approaches a broker-dealer with $50,000 to $100,000 to invest, that’s a small amount for the brokers to get too involved, so they tend to put them into target-date funds or target-risk funds based on their risk appetite,” says Tjornehoj of Broadridge. The underlying funds also play a role in the overall cost. Fund companies such as Vanguard Group and T. Rowe Price build their target-date funds entirely out of their own firm’s offerings. But other firms, including Voya Investment Management, Principal Global Investors, and Charles Schwab, have an open-architecture approach that allows them to include funds from any firm. That sounds like it would be advantageous for the investor, but that’s not always the case. A recent paper co-authored by Martin Gruber, an emeritus professor of finance at New York University, found that target-date fund managers often picked funds that helped their firm’s own objectives at the expense of potentially lower returns. Sometimes that meant picking their own higher-cost fund over a cheaper alternative, or picking a younger, smaller fund from their own stable over one with a longer record—both of which led to underperformance. “For most people who don’t want to get too involved, target-date funds make sense, but they can’t just say it’s a good investment. They have to shop around,” Gruber told Barron’s. It’s not easy to comparison-shop, though, in part because fund firms differ in their views about the right asset allocation and how it shifts over time. Some funds also invest in a more diverse array of assets, which can throw off price comparisons. And some target-date funds are index only, while others are all active, or a mix. All of this is reflected in the spectrum of median expense ratios for target-date series that range from as little as 0.08% to as high as 0.85%, according to Morningstar. Take the Voya Solution series. About 80% of its underlying funds are active, contributing to its higher-than-average median expense ratio. But the fund series is also pricier than other rivals that use active funds, like the John Hancock Multimanager Lifetime series and T. Rowe Price’s Retirement Series. Voya uses both its own funds and subadvised funds, including a multimanager international fund that adds to its costs, says Morningstar analyst Jeff Holt. But Susan Viston, Voya’s senior vice president on its multi-asset team, says the additional cost is “worth it” for providing diversification across asset managers. She adds that the company has introduced two cheaper iterations over the years: the Voya Target Retirement Fund series, which includes a mix of passive and active funds, and another all-passive Voya Index Solution series, which costs 0.18%. Some funds are expensive even when they invest entirely in cheap exchange-traded funds. Of the 22 target-date funds Morningstar evaluates, State Farm LifePath series is the only one that gets a negative rating. The insurer has reduced fees in recent years by as much as 30 basis points and switched to an entirely passive approach. That has helped, but not enough. Though the fund invests in eight iShares ETFs, very similar to the BlackRock LifePath Index funds, the State Farm LifePath series charges 0.77%—about half a percentage point more than BlackRock’s series. Since most target-date funds are held within retirement plans, it’s harder for investors to push plan sponsors to change. But target-date funds have evolved, with newer and cheaper versions. Saving a quarter or half a percentage point adds up, especially over several decades of retirement savings. Perhaps that will be a small ray of light in a bear market for investors who have not yet seen the benefits of the low-fee movement. Bond markets don’t think Greece is less risky than the U.S. It is the difference between European and U.S. bonds that should be drawing investor attention. 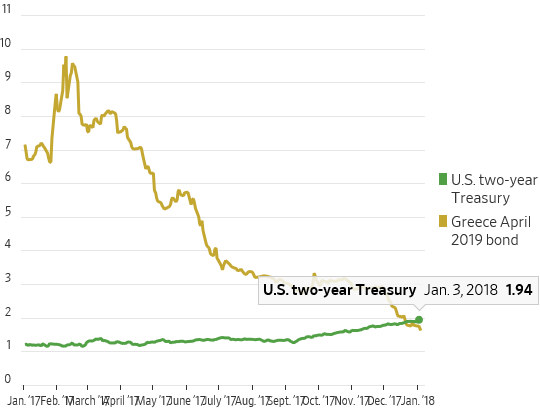 If you thought markets were insane when the yield on European junk bonds fell below that of the 10-year Treasury last year, look away now: the two-year Greek yield has recently fallen below the two-year U.S. yield. Once again, the comparison is flawed. U.S. and Greek bonds are denominated in different currencies with very different monetary-policy settings. The U.S. two-year Treasury yield, now 1.96%, has been steadily rising as the Federal Reserve has been raising rates and signaling more to come. The European Central Bank is still printing money, albeit at a slower pace, and its key deposit rate is negative. Markets don’t think Greece is less risky than the U.S. The relevant risk-free comparison for Greece’s two-year yield of 1.68% is Germany, where it is minus 0.61%. The Greek two-year yield (in reality a 16-month yield since the bond matures in April 2019) is in fact still above Germany’s 30-year yield of 1.25%. Greek yields are only just getting back in touch with their eurozone peers. There are still interesting conclusions to draw, however. The hunt for yield is clearly still going on, and in the eurozone, Greece is the final frontier. The enormous drop in Greek bond yields might be reason to be cautious; the move might be too much, too soon. But rather than exiting the euro, Greece may finally exit its bailout program in 2018. A convergence between Greek and eurozone yields is a necessary part of that process. 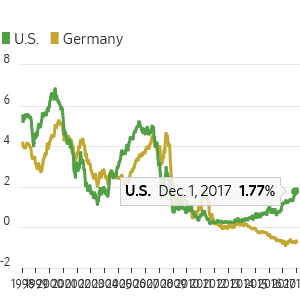 The bigger consideration is the extraordinary monetary-policy gap that has opened up between the U.S. and the eurozone. Although the debate around the ECB is about how and when it removes stimulus, it is still far from raising rates, and will be years behind the Fed when it starts doing so. That German two-year yields are negative and more than 2.5 percentage points below U.S. yields is the real oddity for markets. The report describes the new authoritarian influences being felt around the world as “sharp power.” A recent cover article in The Economist defines “sharp power” by its reliance on “subversion, bullying and pressure, which combine to promote self-censorship.” Whereas soft power harnesses the allure of culture and values to augment a country’s strength, sharp power helps authoritarian regimes compel behavior at home and manipulate opinion abroad. The term “soft power” – the ability to affect others by attraction and persuasion rather than the hard power of coercion and payment – is sometimes used to describe any exercise of power that does not involve the use of force. But that is a mistake. Power sometimes depends on whose army or economy wins, but it can also depend on whose story wins. A strong narrative is a source of power. China’s economic success has generated both hard and soft power, but within limits. A Chinese economic aid package under the Belt and Road Initiative may appear benign and attractive, but not if the terms turn sour, as was recently the case in a Sri Lankan port project. Likewise, other exercises of economic hard power undercut the soft power of China’s narrative. For example, China punished Norway for awarding a Nobel Peace Prize to Liu Xiaobo. It also threatened to restrict access to the Chinese market for an Australian publisher of a book critical of China. If we use the term sharp power as shorthand for information warfare, the contrast with soft power becomes plain. Sharp power is a type of hard power. It manipulates information, which is intangible, but intangibility is not the distinguishing characteristic of soft power. Verbal threats, for example, are both intangible and coercive. When I introduced the concept of soft power in 1990, I wrote that it is characterized by voluntarism and indirection, while hard power rests on threats and inducements. If someone aims a gun at you, demands your money, and takes your wallet, what you think and want is irrelevant. That is hard power. If he persuades you to give him your money, he has changed what you think and want. That is soft power. Truth and openness create a dividing line between soft and sharp power in public diplomacy. 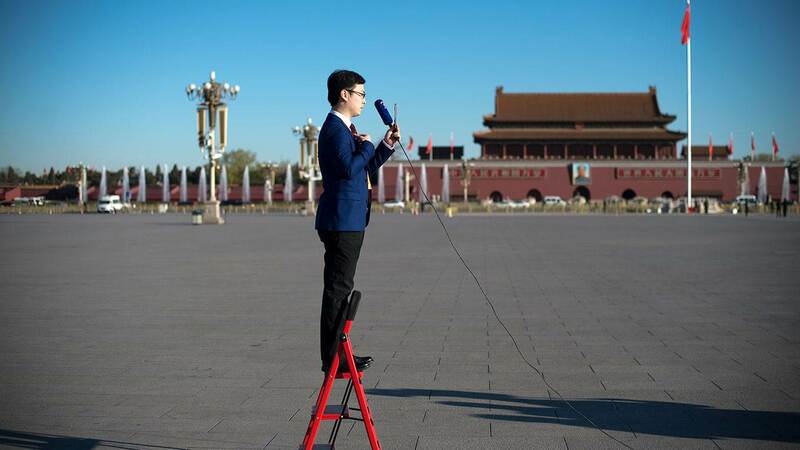 When China’s official news agency, Xinhua, broadcasts openly in other countries, it is employing soft-power techniques, and we should accept that. When China Radio International covertly backs 33 radio stations in 14 countries, the boundary of sharp power has been crossed, and we should expose the breach of voluntarism. Of course, advertising and persuasion always involve some degree of framing, which limits voluntarism, as do structural features of the social environment. But extreme deception in framing can be viewed as coercive; though not violent, it prevents meaningful choice. Techniques of public diplomacy that are widely viewed as propaganda cannot produce soft power. In an age of information, the scarcest resources are attention and credibility. That is why exchange programs that develop two-way communication and personal relations among students and young leaders are often far more effective generators of soft power than, say, official broadcasting. The United States has long had programs enabling visits by young foreign leaders, and now China is successfully following suit. That is a smart exercise of soft power. But when visas are manipulated or access is limited to restrain criticism and encourage self-censorship, even such exchange programs can shade into sharp power. As democracies respond to China’s sharp power and information warfare, they have to be careful not to overreact. Much of the soft power democracies wield comes from civil society, which means that openness is a crucial asset. China could generate more soft power if it would relax some of its tight party control over civil society. Similarly, manipulation of media and reliance on covert channels of communication often reduces soft power. Democracies should avoid the temptation to imitate these authoritarian sharp-power tools. Moreover, shutting down legitimate Chinese soft-power tools can be counter-productive. Soft power is often used for competitive, zero-sum purposes; but it can also have positive sum aspects. For example, if both China and the US wish to avoid conflict, exchange programs that increase American attraction to China, and vice versa, would benefit both countries. And on transnational issues such as climate change, where both countries can benefit from cooperation, soft power can help build the trust and create the networks that make such cooperation possible. While it would be a mistake to prohibit Chinese soft-power efforts just because they sometimes shade into sharp power, it is also important to monitor the dividing line carefully. For example, the Hanban, the government agency that manages the 500 Confucius Institutes and 1,000 Confucius classrooms that China supports in universities and schools around the world to teach Chinese language and culture, must resist the temptation to set restrictions that limit academic freedom. Crossing that line has led to the disbanding of some Confucius Institutes. As such cases show, the best defense against China’s use of soft-power programs as sharp-power tools is open exposure of such efforts. And this is where democracies have an advantage. - Why aren't you more excited about the incredible start stocks got off to in the new year? - According to the Wall Street Journal, it's because "you" might have missed the boat - where "you" means retail investors in general. - I have my doubts about whether this is in fact "the most hated bull market in history" (a popular meme). - My skepticism aside, there's something to be said for the idea that stock market rallies are increasingly meaningless for large swaths of the American public. 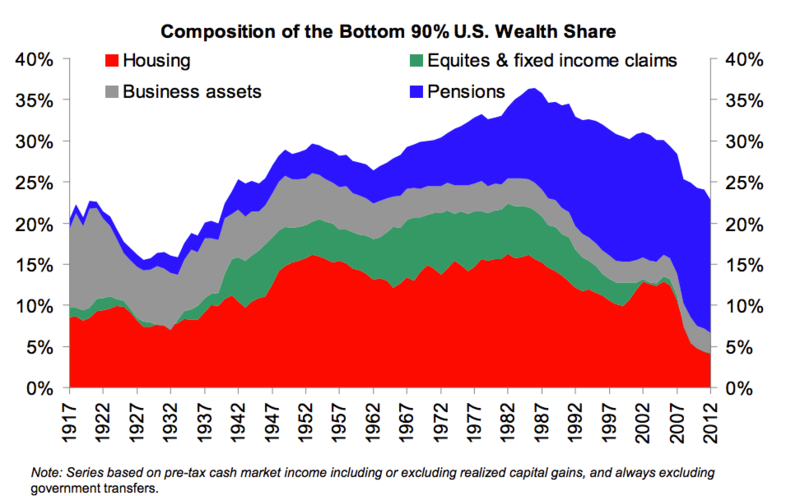 As for equities, they are performing a good job of doing it to portfolio managers all over again. It’s the third trading day of the year and already I can feel the agony of investors falling behind their indexes. Needing a dip to get back on side so early usually ends up forcing traders to chase the market. That's from former trader-turned Bloomberg columnist Richard Breslow and it of course refers to how markets exploded off the starting blocks in the new year. One amusing thing I've noticed lately about the retail crowd is that it isn't readily apparent that they're entirely aware of just how right they've been. I mean sure, I've seen the usual snarky comments aimed at the skeptics over the past couple of days, but nothing that approximates the cacophony that should be emanating from the bulls based on the price action we witnessed during the first trading week of 2018. Not to put too fine a point on it, but if I were a retail investor who is and has been "long and strong", I'd be doing whatever the online equivalent is of scaling the Empire State Building and pounding my chest like King Kong. You'd have to call in the Air Force to shoot me down off the building. For its part, the Dow had its best start to a year since 2006. Do note that even the "worst" performer there (the FTSE) still hit a record high during the week. Again, if I were a retail investor holding passive index funds and I had just gotten off to that kind of start to a year hot on the heels of last year's stellar gains, my significant other would have to drag me down off the roof because I'd be up there shouting about it at the top of my retail investor lungs. 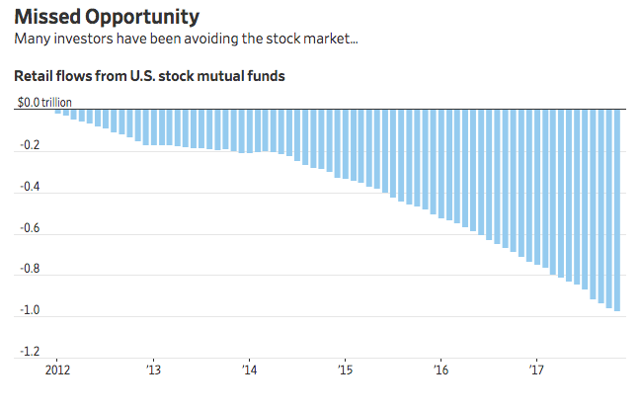 Nearly $1 trillion has been pulled from retail-investor mutual funds that target U.S. stocks since the start of 2012, according to EPFR Global, a fund-tracking firm. 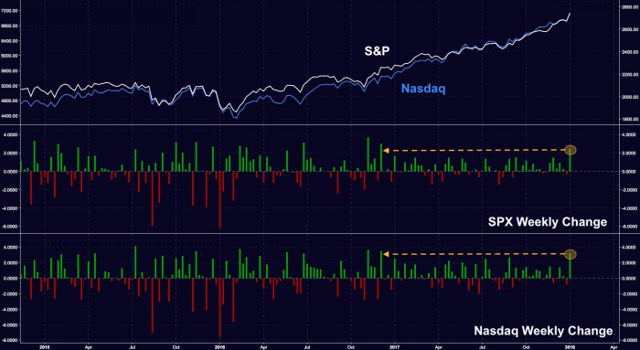 Over that same period through Wednesday, the S&P 500 soared 116% and, along with the Dow Industrials and Nasdaq Composite Index, rose to 190 all-time highs. If you pan out a little further, what you find is that there's some $400 billion in "missing" flows. Regular readers of this report may recall our special edition on active and passive funds. 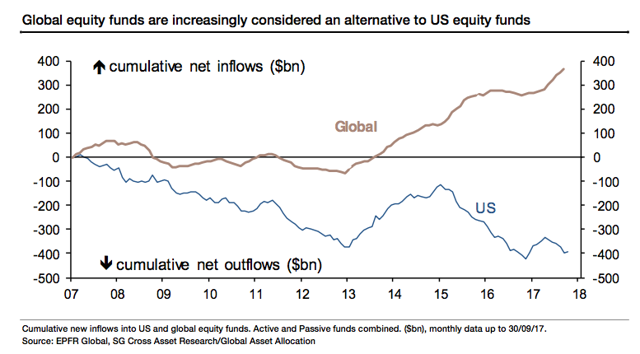 The divergence of investment flows between these two fund categories happened to be particularly strong for US equity. 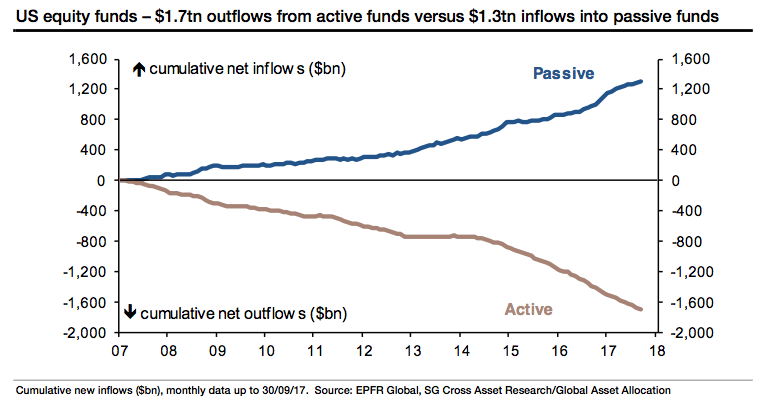 However, the $1.7tn of outflows from active funds was only partly offset by $1.3tn of inflows into passive funds (chart below). "So what happened to the remaining $394bn?," SocGen goes on to ask, in the same note. Global equity funds form a distinct fund category and should not be confused with the sum of country and regional funds that are typically referred to as “All Funds”. Global funds relieve investors from having to make more specific country choices, and they have proven to be highly popular: cumulative inflows of $363bn since 2007 (chart below). By construction and driven by momentum, more than half of these funds still end up in US equities – measured by market capitalisation, the weight of MSCI US in MSCI World is 59%. As an overall conclusion, there seem to have been very little fund outflows from US equities, if any, that could have prevented the exceptional index performance. Shawn Goodspeed, 33, said he dipped his toes into investing shortly after college. After taking advice from CNBC, he said he invested small sums in bank stocks in 2007 and 2008, watching his small investment shrink during the ensuing crisis. She has been selling U.S. stockholdings in recent years, holding more cash and funds that own shares of companies in overseas markets. 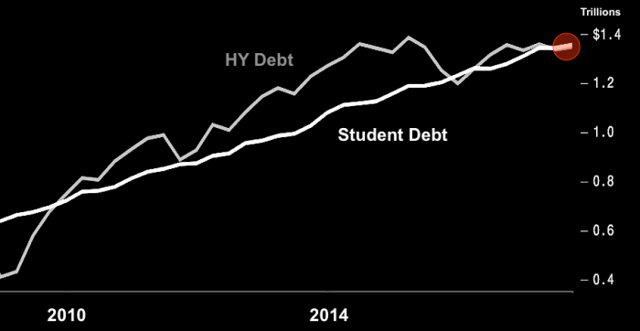 “My money is spent servicing student loans,” said Marcus Wallace, a 25-year-old waiter in Washington, D.C. Until that debt is reduced, he explained, the great stock market bull run will have to go on without him. 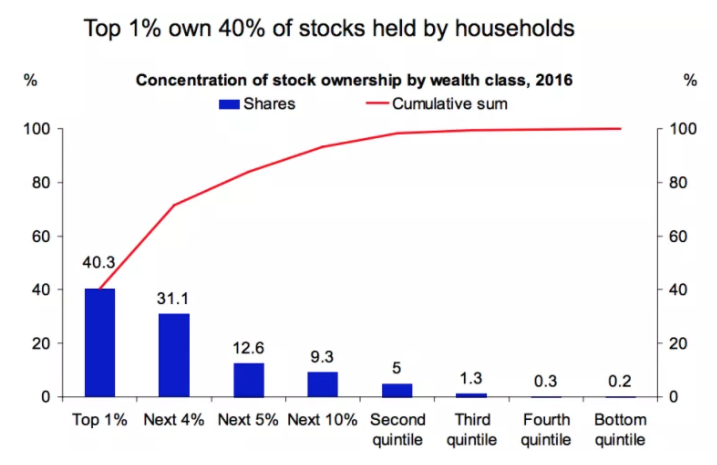 Maybe - just maybe - one of the reasons why this rally seems to some folks like "the most hated bull market in history," is because participation is increasingly confined to a small percentage of the populace. Then again, I'm incredulous about the whole idea of this being a "hated" rally. Because based on my extensive experience with readers both on this platform and on my own site, a whole lot of people are loving every minute of it. And I'm sure that will be reflected in the comments section here.